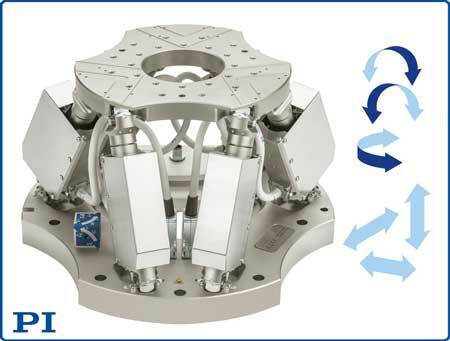 (Nanowerk News) With the usability of 6-axis hexapods increasing in research and industry applications, PI introduces a new medium load 6-axis precision motion platform, the H-825 hexapod. The H-825 provides a self-locking load capacity up to 30 kg (66lbs). The motion range is up to 55mm (linear) and up to 38 degrees (rotation). High system precision is guaranteed by absolute encoders and an actuator resolution of 8 nanometers – with excellent position repeatability of ±0.1 µm and ±2 µrad, respectively. The parallel-kinematic design of the hexapod makes it smaller and stiffer than traditional 6 axis positioning systems while providing a higher dynamic range. The parallel kinematic design (all actuators working in parallel on one moving platform) does away with issues caused by moving cables – a decisive advantage in terms of reduced friction and reliability. The brushless servo motors employed in all 6 hexapod struts provide the long lifetime required in industrial precision positioning and alignment applications. The new hexapod also features absolute measuring position encoders, eliminating the need for referencing the system during power up. Absolute encoders also ensure that any operation can be continued seamlessly in case of a power interruption. PI hexapods come with state-of-the-art controllers and software tools based on 25 years of hexapod R&D, resulting in fast solution implementation to a plethora of applications from medical to photonics. All 6 axes can be commanded simply as Cartesian coordinates, and the center of rotation can be changed on the fly with a software command.